The Leather Handle and Chain Leash from Sax Leather is another example of how Sax Leather gets it’s right every time. As soon as you pick up this quality leash you can feel the weight of it, a heaviness that screams Dominance and Submission. The leather handle is generously sized in the length and thickness of the leather. The chain of the lead itself, and authoritatively sized clip hook, are the real winners here. The coolness of the chain leash could easily add delicious sensations into your play activities, or for the more daring be used for harder impact play. However you choose to use it, this bold leash will command attention. As with all Sax Leather products the Leather Handle and Chain Leash is made from only the highest quality materials. Made here in Australia you can be sure of the quality. Fit for purpose this piece is build for the tough play. Not a novelty piece. 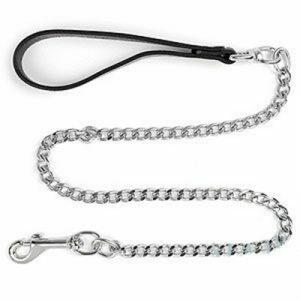 This chain leash is ideally coupled with a collar, cuffs or a body harness. The only choice is whether to lead or follow? For maximum life of this piece we recommend looking after the leather handle as you would any other leather products. Also ensure it is dry when stored, and keep out of directly sunlight during storage. High quality leather & metal components. Leather Handle - 2.5cm wide.